Oct. 7, 2013. 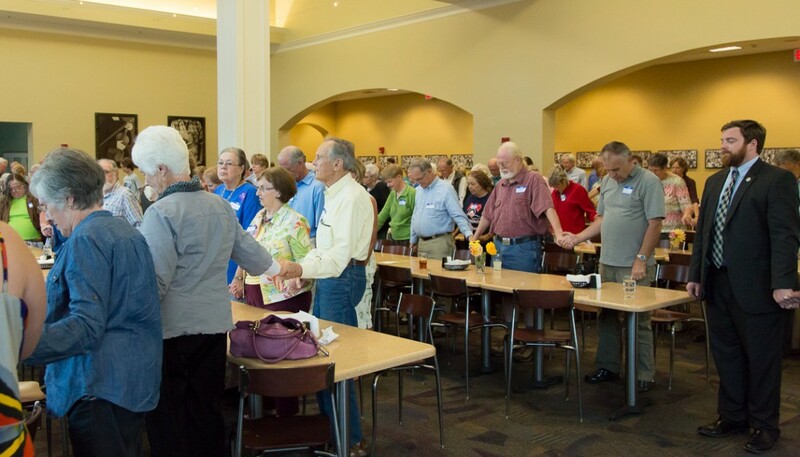 The main dining facility at Appalachian State University was thronged on the evening of Sunday, Oct. 6, by “fired up and ready to go” Watauga County Democrats who came to hear State Senator Josh Stein, eat barbecued chicken, and enjoy each other’s company. Senator Stein praised local organizational zeal and said that if every county was like Watauga, Democrats will take back the North Carolina General Assembly in the next election. He also reported on the radicalism of the Republicans during the past nine months, endorsed Attorney General Roy Cooper for Governor, and announced that he would himself be running to replace Cooper in the Attorney General’s office. Appalachian State College Democrats sponsored and hosted the event, and President Mollie Clawson welcomed attendees on behalf of the club. Member Ian O’Keefe, who is also Field Director for the WataugaDems, introduced Senator Stein. Also speaking were Blowing Rock Town Council candidate Sue Sweeting, Boone Town Council candidates Rennie Brantz and Jennifer Pena, and Boone Mayor candidate Andy Ball. The 2013 inductees into the Watauga County Democratic Hall of Fame were announced by Party Chair Diane Tilson: retiring Boone Mayor Loretta Clawson, party Volunteer Coordinator Marsha Walpole, activists Pam and Jerry Williamson, and party Treasurer Susan Phipps. The citations that Chair Tilson read aloud are reproduced below. Loretta Clawson has been an active member of the Watauga County Democratic Party since the world was round, since water ran downhill, since milk made butter, and toast looked forward to jam. She has held virtually every precinct office and party executive office that’s available to be held, including Chair of the County Party from 1993 to 1995, which means that she had a close-up view of the terrible defeats the statewide Democrats experienced in 1994. But what did she do after that horrible year? She didn’t stop, she didn’t give up, she didn’t back down. Instead, she began building toward a run for Boone Town Council in 1997, and she won that election. She won every reelection bid after that too, including some awful brutal ones, and she became Boone’s Mayor in 2005, the office to which she’s been repeatedly reelected. She has earned state-wide recognition and universal praise. She was one of the first North Carolina mayors in 2008 to endorse presidential candidate Barack Obama, and she is well known among other mayors in the state for her stands on neighbourhood protections and the health of our cities and towns. She fearlessly led the fight for a steep-slope ordinance in the Town of Boone, for which she earned the praise of the Winston-Salem Journal and the vilification of certain mega-developers. She continues to serve on candidate recruitment committees and on candidate campaign committees, and just this year she returned to one of her best-loved positions, President of the Democratic Women’s Club. We are so very pleased to honor her among the 2013 inductees in our Democratic Hall of Fame. If a political party can be said to have a heart and a soul, I would nominate Marsha Walpole for both roles. She is a steady rudder to our ship, the unflappable stabilizer to whatever turbulence we encounter. Her deep involvement in the Watauga County Democratic Party does back to the 1990 Harvey Gantt for Senate campaign, during which she and husband Matt, in between carrying Watauga for Gantt that year, also became pregnant with their son Chandler, who is now a college graduate himself. Marsha has served this Party in so many capacities, from Party Treasurer to her current role as Volunteer Coordinator and leader of our monthly “Cash Mobs.” She has served many individual candidate campaigns as treasurer and trusted councillor. Marsha won a seat on the Watauga County Board of Education and served the students and teachers of our county with distinction. She and Matt have also contributed immeasurably to the intellectual and cultural life of the community by cherishing and selling rare and used books — for many years in a storefront on King Street and now primarily online. Their Row By Row Bookstore led to Marsha’s active involvement in the Downtown Boone Development Association and now to her work in the Appalachian State University Bookstore. We are so very pleased to honor her among the 2013 inductees in our Democratic Hall of Fame. Pam and Jerry Williamson were inducted into the Hall of Fame for the WCDP. It is actually necessary to say those two names together, because they are such a team. They arose as forces to be reckoned with in the 1990 senatorial campaign of Harvey Gantt, right alongside Marsha and Matt Walpole, trying to unseat “Senator No,” Jesse Helms. It was during that 1990 campaign that the Williamsons began building the network and the coalitions that still survive to this day, the progressive core of this county that carried Watauga for Harvey Gantt, that carried this county twice for President Bill Clinton, in 1992 and again in 1996, that won it for Democratic commissioners Sue Sweeting and Art Kohles in 1998, and for many Democratic candidates for County Commission and for Boone Town Council since then. “That Damn Pam” is famous, or infamous depending on your point of view, for her determined advocacy, her bulldog’s approach to problems, her fearlessness in the face of overwhelming odds, and for “Pam’s Picks,” which so many of us depend on when we go to vote. She always says that she’s proudest of helping people who can’t easily help themselves – endangered neighborhoods like Junaluska, the dispossessed residents of a trailerpark, people fighting asphalt plants. She wins some, she loses some, but she never gives up. She was the first statewide honoree of the North Carolina Democratic Party’s “Grassroots Activist Award,” and she and Jerry got even wider recognition in 2005 with the Helen M. Lewis Community Service Award, given by the Appalachian Studies Association. Meanwhile, Jerry likes to downplay the 30 years he spent as a faculty member at Appalachian State University, and the years he spent publishing books and articles and editing the Appalachian Journal. Some of you may not know about any of that past. He likes to say now that his life began with the Harvey Gantt campaign in 1990 and really got going just ten years ago when he began to blog at Watauga Watch and started causing heartburn for Republicans (and for some Democrats too). As a blogger he’s been denounced on the radio, contacted by the State Bureau of Investigation, threatened by a judge, and cussed by the powerful. Oh yeah, and he also likes to live dangerously by disagreeing often with Pam, and in public. We are so very pleased to honor them both among the 2013 inductees in our Democratic Hall of Fame. Phipps was inducted into the WCDP Hall of Fame. Susan Phipps has had two very distinct careers: one as an accomplished and beloved teacher in Watauga County schools and a second as treasurer of our Democratic Party since 2005. She has continued to be an advocate for education and for teachers, especially in the face of the devastating cuts to North Carolina schools enacted by our wrongheaded and backward General Assembly. She recently stood with Bob Etheridge at a Public Schools First rally in Boone, and she is an effective spokeswoman for the importance of public education in our state. As treasurer of our party, she is without peer. None of us can say enough about her work ethic, her artistic flair, her organizational skills. She is the personification of “grace under pressure” and “coolness under fire.” Whatever activity the Party pursues, Susan is there. She serves on multiple campaign committees, chairs the Party’s Finance Committee, has been a prime mover for our Home & Garden Tours, and she also – outside of political activity — serves as an adjunct faculty member in the Reich College of Education at ASU, helping to train student teachers. Susan volunteers for the Party’s Meals-on-Wheels route, for our monthly Hospitality House dinners, and she is currently president of the Boone Service League, which raises and donates money for student scholarships and to support the important work of organizations like Children’s Advocacy Center of the Blue Ridge, the Hunger & Health Coalition, OASIS, and the Children’s Playhouse. We are so very pleased to honor her among the 2013 inductees in our Democratic Hall of Fame. See more photos of the rally by Lonnie Webster below. Watauga County Young Democrats pose with Stein at the rally. Jesse Presnell, third vice chair of the Watauga County Democratic Party, inducts Susan Phipps into the WCDP Hall of Fame. Jerry and Pam Williamson were inducted into the WCDP Hall of Fame on Sunday. Jesse Presnell, third vice chair of the Watauga County Democratic Party, inducts Marsha Walpole into the WCDP Hall of Fame. Jesse Presnell, third vice chair of the Watauga County Democratic Party, inducts Boone Mayor Loretta Clawson into the WCDP Hall of Fame. Boone Mayoral candidate Andy Ball speaks. Boone Town Council candidate Jennifer Pena speaks. Susan Phipps, Jerry and Pam Williamson, Loretta Clawson and Marsha Walpole were all inducted into the Watauga County Democratic Party Hall of Fame. Blowing Rock Town Council candidate Sue Sweeting speaks. The dining hall at ASU was packed for the Watauga County Democratic Party Fall Rally.